The reconfigurable mold J (RCM-J) was designed to produce linear components made from urethane elastomer compos­ites of two different Shore hardness. Our experiments with fusing elastomers had found that we could get varying elastic performances from the same sized object simply by altering its hard to soft rubber composition. 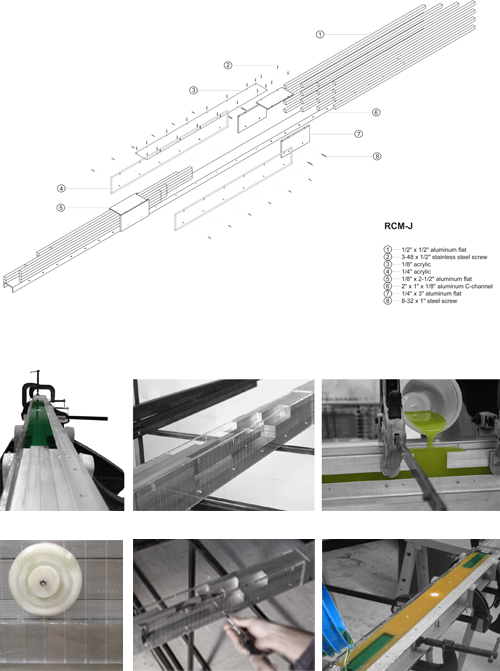 The RCM-J positions and repositions 18 aluminum rods to consecutively produce dif­ferent cavities for hard (80 Shore) followed by soft (40 Shore) rubber pours. The two rubbers fuse overnight to make a single component which when combined with other similar types can develop more complex objects like the columnar structure that we have designed. The RCM-J is capable of producing a tremendous variety because of all the parametric variation- length, pattern and hard/soft ratio- that it can control. The single mold produces all the parts that we need, through its various stages of fabrication process it can give us precise feedback of measurements (rubber quantities and dimensions) as well as produce identical repeatable products. A composite material draws on the properties of its individual parts such that their cumulative effect transcends the sum of their separate performances. With urethane elastomers a composite can be created by bonding different shore hardnesses together. These composites exhibit multiple elastic behaviors within the single material. Our research has dealt with perfecting the bonding process as well as developing a molding process which could allow for complicated blends. The composite elastomers created for Open Columns use rubbers of shore hardness 45 and 85. In order to pour the individual components, called rods, a special reconfigurable mold (RCM-J) was built. This made it possible to consecutively pour soft and hard rubbers without disturbing previous pours. In addition the RCM-J is also a calculating machine, whose 32 shifting parts are all of the same volume. Through simple arithmetic we are able to calculate the amount of rubber we need from the cavities that they create. In this regard the RCM-J has all the possible variations of rods that we may need preprogrammed into its hardware.